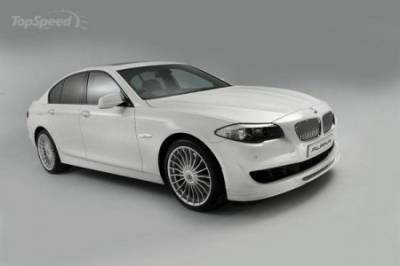 The famous German bodybuilder studio Alpina presented a slightly modified program to improve the BMW 5-Series, that in itself is pretty good. Initially the program Alpina B5 BiTurbo conceived as a highly productive and impressive, but the master of the studio decided to revise it, to make even more attractive to their customers. The whole idea was, that would make the 500-horsepower 4.4-liter eight-cylinder twin-turbo engine produces 533 horsepower through a small refinement to mind. All improvements have allowed B5 BiTurbo better indicator of performance: earlier starting time to "hundreds" was 4.7 seconds and top speed - 305 km / h Now - 4.5 seconds and 315 km / h As for appearance, then all the changes were kept to a minimum, so that we should not expect much, as soon as the car will debut in Geneva.